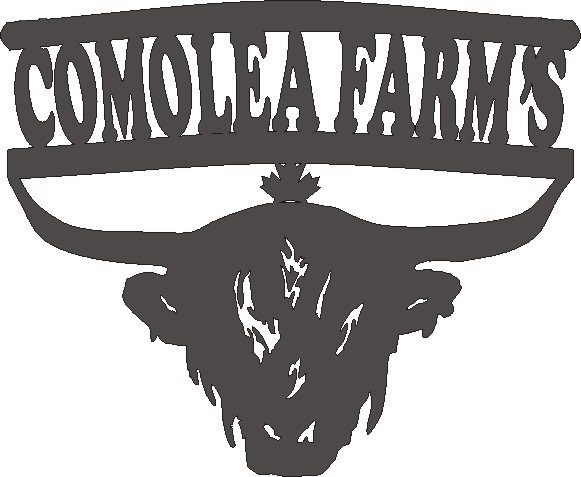 At Comolea Farms, we are focused on breeding quality not quantity with the highest levels of customer satisfaction & we will do everything we can to meet your expectations. Highlands are one of the oldest breeds of cattle dating back hundreds of years. They originated on the West Coastal Islands of Scotland where the cold Atlantic winds helped create this very hardy, versatile breed that still maintains it’s original characteristics. They have a double coat of hair; an inner downy coat to insulate them and a long well-oiled outer coat which protects them against the elements, which they shed in the warmer months. All Highlands have what is called a Dossan, which is the hair that hangs over and covers their face and eyes, this long hair helps keep the flies out of the cattle’s eyes; pink eye in Highland is very rare. Their long horns grow a little every year, both male & female have horns, which are great for scratching. These Majestic Highland Cattle can live up to 20 yrs & the females can give birth to 15 – 18 calves in their lifetime. Highlands are known for calving easily, they are gentle cattle by nature but they will vigorously defend their calves & any other livestock that are pasturing with them against coyotes, wolves or even bears. When threatened they behave much like buffalo’s forming a circle around the weaker livestock facing outward with their horns ready to defend. Highlands are able to withstand Temp. of -40 degrees fahrenheit with minimal shelter; they will eat weeds and roughage that other breeds of cattle wouldn’t touch. Highlands have less back fat as compared to other cattle, as Highlands evolved they grew a double coat of hair that acts as an insulator that protects against the elements, this is what keeps the beef so lean that it meets the Heart & Stroke Foundation’s guidelines for lean beef. Studies have also shown that grass fed Highland beef is higher in Omega 3 fatty acid (which is a good fat), vitamin A & E, Iron, Protein and is lower in Cholesterol, Saturated fats and Gluten then your average cattle, most cattle will not thrive on just grass like Highlands do. Although corn will make cattle put on weight rapidly, it does change the bacteria in the cattle’s stomachs (they have 4 stomachs) which means that they can no longer break down E-coli properly, which thereby raises the risk of contamination. When NOT feed corn, there is a lower risk of E-coli as grass fed cattle are better able to naturally break down the E-coli. Highland cows can be milked but they are not mass producers of milk, their hair can be collected and used for knitting; the horns can be used for practical as well as decorative, the hides make great wall, bed or floor coverings and the beef is of thee highest quality.